It’s important to know that depression and symptoms of depression are not natural parts of aging. Some sobering statistics: Nearly two million Americans age 65 and older have a what is called a “depressive illness” (including: major depressive disorder, dysthymic disorder or bipolar disorder) and another five million may have ‘subsyndromal depression,’ which is a set of depressive symptoms that do not meet the full diagnosis for a depressive disorder. According to the National Alliance on Mental Illness (NAMI), depression affects more than 6.5 million of the 35 million Americans aged 65 years or older. Most people in this stage of life with depression have been experiencing episodes of the illness during much of their lives. For others, depression has a first onset in late life—even for some who are in their 80s and 90s. Combined and confused with other conditions. Depression often co-occurs with conditions such as heart disease, stroke, diabetes, cancer and Parkinson’s disease. The depressive symptoms often persist and get in the way of (often significantly) a person’s ability to function effectively and consistently. 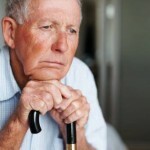 For a variety of reasons, depression is often under-/ mis-treated and under-mis-diagnosed in the elderly population. The symptoms of depression are also sometimes mistaken for other common conditions, such as Alzheimer’s, Parkinson’s, dementia, arthritis, heart disease or thyroid disorders.